Several weeks ago, we showed you how to use Segue in Storyboard to pass data between different view controllers. We’ve built a simple app to display a list of recipes. When user taps on any of the recipes, the app navigates to a detailed view and brings up the recipe name. This is very simple app. 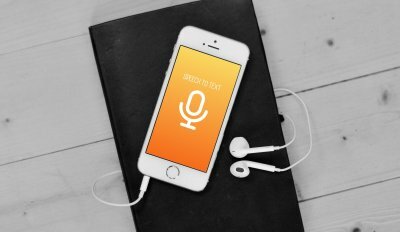 But if you understand how it works, this is the foundation to help you advance into a full-fledge iOS developer. You have to understand the basic OOP concept before you can work on this tutorial. If you haven’t done so, take some time and read through the article. You can’t become a full-fledged iOS developer without learning objects and classes. To give you an idea about the improvement, let’s first take a look at the final deliverable. 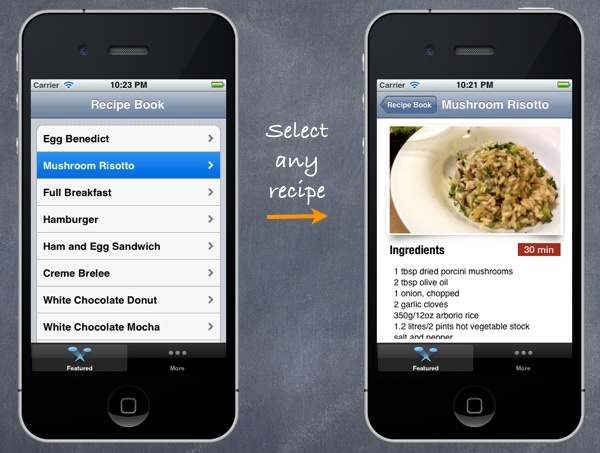 As you can see from the sample screenshot, the revamped Recipe app shows user detailed information about a recipe. We simply set the property (i.e. 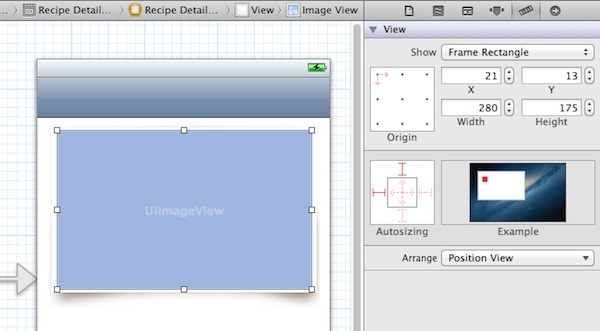 recipeName) in the RecipeDetailViewController to pass the recipe name. Obviously, you can add other properties in the detail view controller to pass other recipe-related values. However, this is not the best practice. If you’ve read the OOP tutorial, you know it’s better to create a Recipe class and group all the properties within the class. First, download this Xcode project. 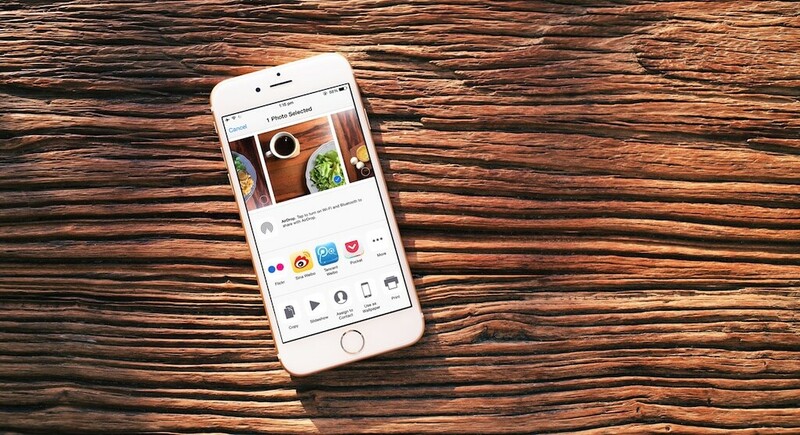 You’ll use this project as a baseline to build the app. We’ll first create the Recipe Class. Right click on RecipeBook folder and select “New File…”. 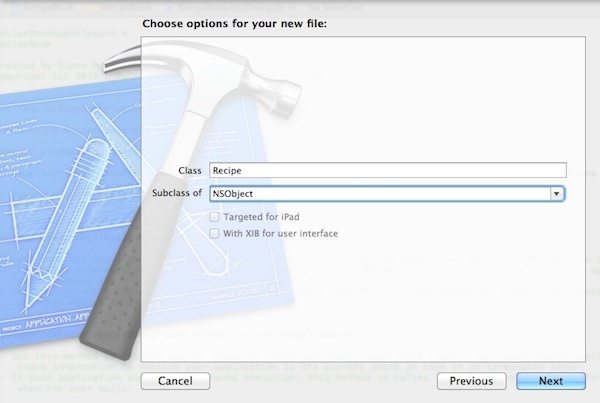 Choose the “Objective-C class” template (under Cocoa Touch) and click “Next”. Name the class as “Recipe” and as a subclass of “NSObject”. Click “Next” and save the file in your Xcode project folder. In the implementation file (i.e. Recipe.m), we add the @synthesis directive. The @synthesize directive tells the compiler to generate the setters and getters for accessing the properties we define in the header. Now we’ve created a Recipe class with various properties including recipe name, preparation time, image and ingredients. Later we’ll make use of it to instantiate different recipe objects and pass it to the detail view controller. To keep thing simple, we’ll populate the recipe data right in the “RecipeBookViewController”. In real app, this kind of data are usually stored in property list file or database. In the “viewDidLoad” method of “RecipeBookViewController.m”, we initialize the Recipe objects (with different preparation time, ingredients, etc) and put them into the “recipes” array. Originally, the detail view controller only displays the name of recipe. We’re going to revamp it to show users more information about a recipe. First, download this image pack and add all the images to the projects. The above code will load “[email protected]” on device with high resolution. While on the standard screen resolution, it loads up the “photo-frame.png”. 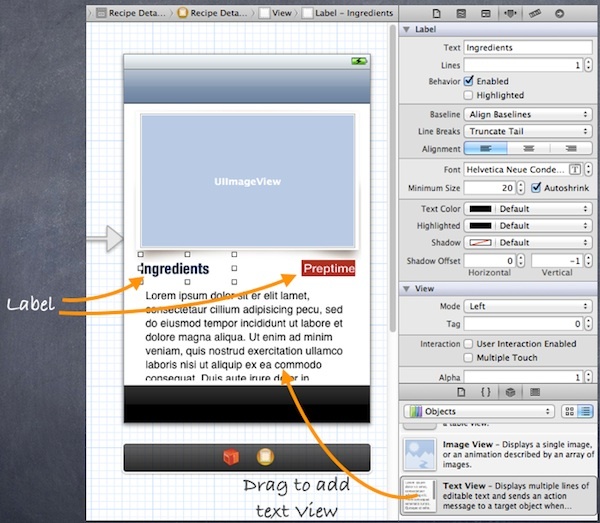 Select the Storyboard and locate the “Recipe Detail View Controller”. 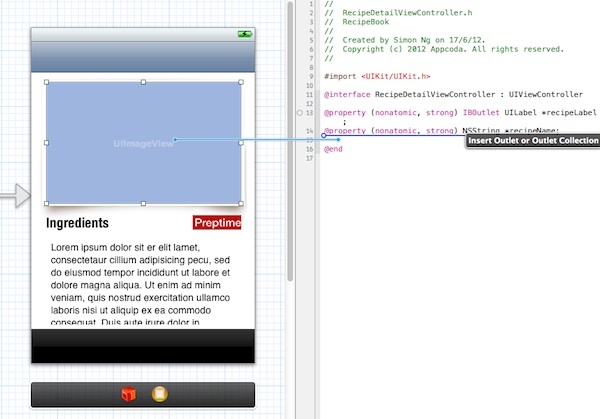 First and foremost, delete the “Label” component and add an image view to the detail view. Set the width and height of the image view to 297 and 199 respectively. Select the attribute inspector and set the image to “photo-frame.jpg”. As you set the image, it’ll be automatically loaded and displayed in the Storyboard. This image is used to display a photo frame for the recipe photo. Next, we add another image view that serves as a placeholder of the recipe photo. 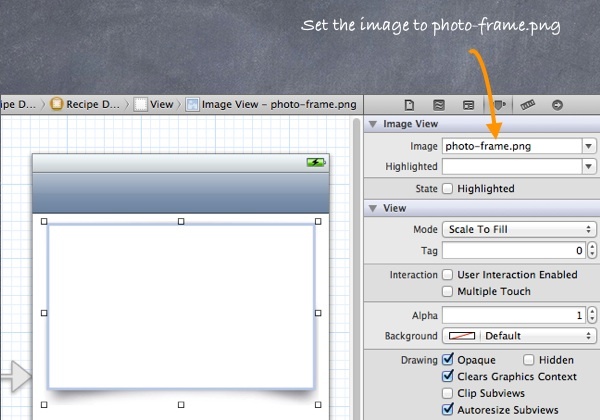 Drag the image view from the Object Library and place it over the photo frame like the screen shown below. With the redesigned interface, we’ll establish the connection between our code and the UI elements. 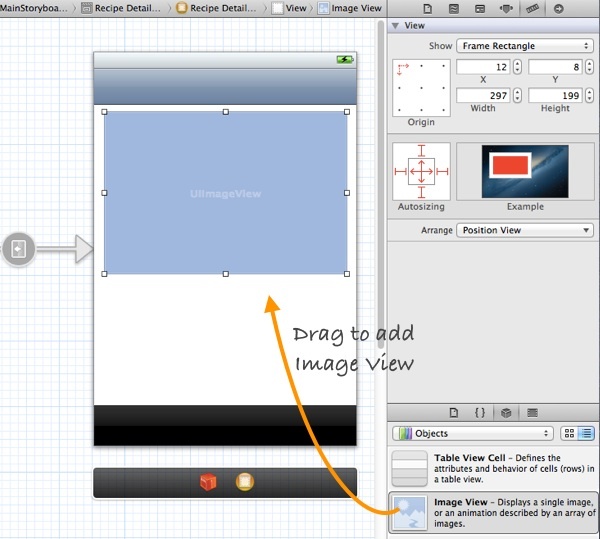 In the Storyboard, select the “Recipe Detail View Controller” and switch to the Assistant Editor. Press and hold the control key, click the image view and drag it towards the “RecipeDetailViewController.h”. As you place the pointer between the “@interface” and “@end” keywords, you should see a prompt that allows you to insert an outlet. Name the outlet variable as “recipePhoto”. Here, we add code to setup the Recipe Detail View. Line 5 of the code alters the title of navigation bar to the name of recipe. Line 6 and 7 configure the preparation time label and set the recipe photo. Line 9 to 13 turns the ingredients array into multiple lines of text for the ingredient text view. The “\n” character is an escape character to say “Put a carriage return here”. In other words, it’s a new line indicator. 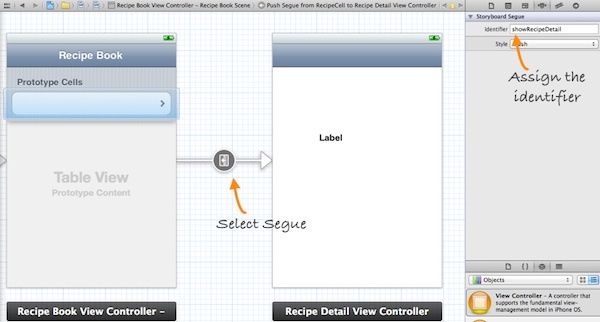 As we’ve learnt in the Segue tutorial before, Segues manages the transition between view controllers. When a segue is triggered, before the visual transition occurs, the storyboard runtime invokes prepareForSegue:sender: method of the current view controller. By implementing this method, we can pass any needed data to the view controller that is about to be displayed. 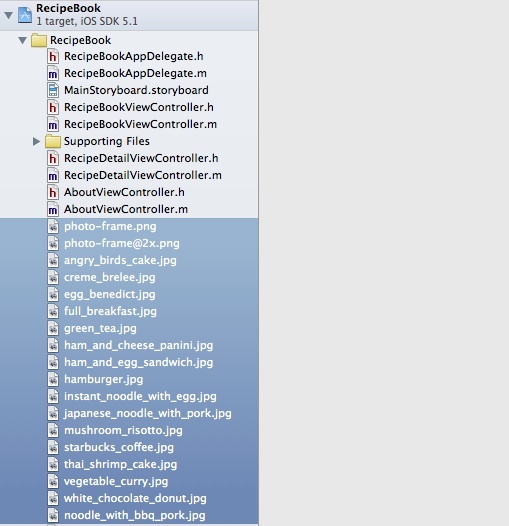 Here, we’ll pass the selected recipe object to the detail view controller. Line 5 of the above code determines the selected recipe (base on the indexPath) and passes it to the Recipe Detail View Controller (i.e. the destViewController variable). You’ve made it! The final step is to execute the app and see how it works. If your app can run properly, it should give you a much polished Recipe Details. I hope you enjoy the tutorial and love the app you just built. It’s not a complex app but it covers some of the most common UI elements such as navigation controller and tab bar controller. Don’t wait for the next tutorial to show you what to do next. I encourage you to tweak the app and make it even better. Say, use a table view (instead of text view) to list out all ingredients or add a new tab item. As I said before, you can’t become a good programmer by just reading a book or this tutorial. You have to explore, make mistake and most importantly code! So base on what you’ve learnt, tweak the app and turn it into your own. 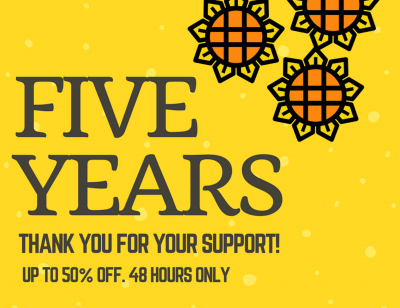 As always, leave us comment to share your thought. Update: You can download the source code of the Xcode project from here.